Greg Ehm - Industry writer, on behalf of Vermeer Corporation. Vermeer’s TR 620 trommel is ideal for processing compost, mulch and topsoil, as well as biomass and aggregate material, or for pre-screening wood waste. Trommel screens have quickly become one of the most popular ways to process waste materials into high-quality compost, mulch and topsoil. However, a trommel screen is not limited to these markets. Owners are finding new ways to utilize these versatile sizing machines and along the way are discovering new markets. For the novice, a trommel screen is basically a sizing machine. Materials, like compost, topsoil, wood waste and mulch, are placed into a hopper using a wheeled loader. The material in the hopper is then fed through a rotating circular drum that uses a screen. Screens come in a variety of sizes and let material pass through that meet the desired end-product size. According to Ted Dirkx, recycling and forestry applications specialist at Vermeer, trommel screens offer a great deal of versatility. Another advantage of a trommel screen is the adjustable brush systems that continuously clean the screens, helping to keep openings clear of debris and promote better sizing. Since the trommel screen features a rotating drum and screen, the lifting and dropping action offers better mixing and separation of the material. Traditionally trommel screens have been used for compost, topsoil and mulch, but new markets are emerging that offer expanded opportunities in the energy, value-added mulch, pre-screening and aggregates arenas. The booming biomass and pellet industries are two major new markets for trommel screens. These industries use pneumatic feeding systems to transport wood biomass to burners. However, these systems have stringent specifications and require the material to be sized, with long wood fibres and fines removed. The long wood fibres can become lodged in pneumatic feeding tubes and result in potential jams. On the flip side, fines like sand and dirt, combined with the rapid airflow in the pneumatic feeding tubes, can act like a sandblaster and deteriorate the burner. Trommel screens can be used to very efficiently and accurately size biomass material to specifications desired by the biomass or pellet plant. Another movement underway is prescreening. Land-clearing operations are using trommel screens to prescreen wood waste prior to the grinding operation, to remove non-organic material that could cause damage to the grinder. Still one other overlooked application is the screening of crushed concrete contaminated with topsoil. You can create two salable products in just one pass through the use of a trommel screen. However, it is important to note that the trommel should be equipped with a grizzly – a grid that removes large material from the raw material before it enters the machine for processing – over the feed hopper. Heavy-duty screens are also recommended in this type of application. “I believe pre-screening is an under utilized method in composting operations,” Dirkx says. Additionally, some composting facilities are now taking in curbsidecollected green waste – paper bags and brush. Most operations take all that raw material and process it in a grinder, and then place it into a compost windrow. However, some of that material may already be the desired end-product size, so there may be no need to process this material in a grinder. 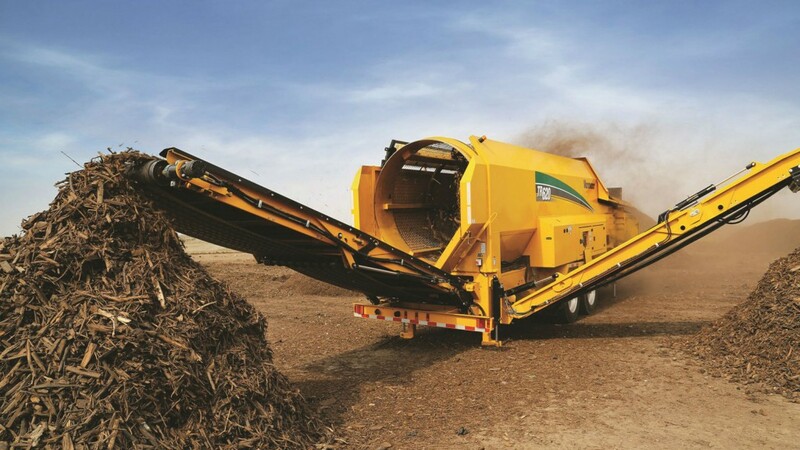 Pre-screening allows a composting operation to separate those correctly-sized materials in order to limit the volume of material passing through a grinder. Yet another recent industry innovation is the ability to create three products from one trommel pass. With a three-product trommel, a contractor can remove fines at the front end of the process, followed by the long pieces of material, which will be pulled out as “overage”. What you’re left with is a nice, consistent mid-size product that meets specifications. With a two-product trommel, you would need to process the material twice to achieve the same results. For example, when you buy and open a bag of mulch, you do not see very much fine material or oversized product. Traditionally, a mulch producer may have conducted a primary and secondary grind to size the mulch product. With a three-product trommel, a mulch operation can complete a primary grind to produce a 4 to 5 inch product (10.2 to 12.7 cm). By processing the 4 to 5 inch (10.2 to 12.7 cm) primary ground product in a three-product trommel, you can pull out the fines and remove the overs, and what you’re left with is a third end product. Finally, trommels with an auger drum also have the durability to process aggregate material or soil with rocks and large chucks of wood from land-clearing applications. Trommel screens are not high-tech units, but there are a few features you should look for before making a purchase decision. Additionally, Dirkx suggests you select a manufacturer that has a strong local dealer network and parts support who can assist you in identifying potential new applications in your area. When it comes to screens, they can range from 1/8 inch to 4 inches (0.3 to 10.2 cm) in grid size and can vary from slotted to fine-gauge wire to stainless steel. Depending on the design of your machine, changing from one screen to another takes about 45 minutes per panel, or you can change out the entire drum with another that is already outfitted with the screens you need. Before you buy a unit, make sure you match the trommel screen to your production needs. Dirkx provides a formula for this match-making process, and notes that the types of raw material and its moisture content can also affect the calculation. “Start by gathering the estimated total annual volume, then estimate how many hours a day the trommel will be in operation and wrap up by selecting a screen size,” Dirkx says. “Using this information, an estimate of the trommel screen production required on a daily, weekly or monthly basis can be calculated to help identify annual production goals.